Tokkou was published in English by Tokyopop from July 1, 2008 to February 1, 2009. 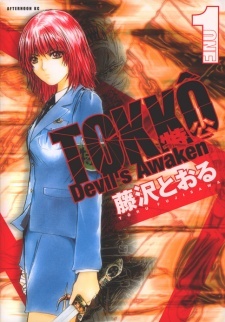 The first two volumes were titled Tokko: Devil's Awaken, the third volume Tokko: Phantom Hunter. Tokko is an action/horror/seinen manga that combines familiar elements in a stylish visual package. The story takes place in Tokyo where the undead have found a way to escape into our world through special "gates". All hope to prevent the end of the world rests on a group of characters (hunters) who have survived the violent attacks by forming a symbiosis with the undead residing in their bodies. This all sounds like its been done before but the way Tokko presents these events distinguishes it from similar manga out there. The initial volumes set a great premise and the story smoothly unfolds as you get to know the lead characters while weird events happen all around them. Minor spoiler alert -> the manga has a lot of interesting concepts and little tid-bits that help it stand out such as the premise that hunters have to awaken the monsters within them and it depends on the character what kind of monster/undead spirit awakens. There were various aspects of the undead world that, although not properly developed or elaborated upon, I still found enthralling. At the end of volume 2, the primary story halts and volume 3 concentrates on a new narrative with fresh characters. This was a weird decision on the manga-ka's behalf as it cuts off the reader's interest that has already familiarized himself with the details of the original plot.